cooling by heat of evaporation Through the combination of humidity, heat, and the wide surfaced open cell cellular material, latent heat of evaporation arises, which keeps the beer at drinkable temperatures. 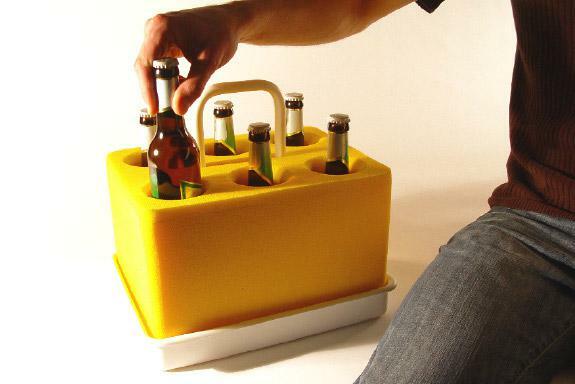 prototype The 6pack-cooler consists of a Sponge-body and a tray with a handle. As well as the normal 6pack-bottles, any 0,3l-0,5l bottle fits into the 6pack-cooler holes.